The Activity Book project was designed to create a fun way to learn about the MRW and other watershed facts. Funding was obtained through the Great Lakes Energy People Fund with a match from the Wege Foundation and Fremont Area Community Foundation (FACF). All MRW 4th grade students were invited to enter a contest to design the cover of the book. Cruz Rodriguez from Oakridge Upper Elementary School in Muskegon County won the contest (picture above) and received a $100 U.S. Savings Bond. Jake Justice from Weidman Elementary in Mecosta County was the runner-up and received a canoe rental pass. Terry Stilson, MRWA Program Coordinator, designed the book. The book was reviewed by the MRWA Education Committee and Executive Board, providing comments and edits. The draft book was then sent to the Stanwood Elementary 4th grade classrooms who reviewed it for age appropriateness and ease of use. Recommendations from Stanwood Elementary teachers were incorporated in the final draft. 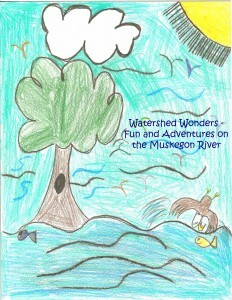 The Activity Book was completed in the summer of 2009 and sent to all 4th grade classrooms in the Muskegon River Watershed for use in their 2009-10 school year. In 2012, all 4th and 5th grade students in Newaygo County received a copy of the Activity Book through grant funds from the Fremont Area Community Foundation. In 2014, all 4th and 5th grade students in our watershed in Newaygo, Montcalm, and Osceola Counties were provided copies of the activity book using grant funds from FACF, Meijer Foundation, and Osceola County Community Foundation.